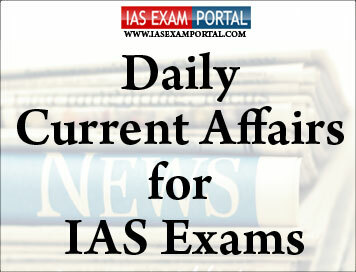 Current Affairs for IAS Exams - 17 JANUARY 2018 | IAS EXAM PORTAL - India's Largest Community for UPSC Exam Aspirants. The government on Wednesday notified the appointment of Karnataka High Court Chief Justice Dinesh Maheshwari and Delhi High Court judge, Justice Sanjiv Khanna, as Supreme Court judges. The Collegium led by Chief Justice of India Ranjan Gogoi unanimously recommended Justice Khanna’s name along with Justice Maheshwari's on January 10, despite objections raised by sitting apex court judge, Justice Sanjay Kishan Kaul. The Annual Status of Education Report (ASER) 2018, the results of a yearly survey that NGO Pratham has been carrying out since 2006, shows that more than half of Class VIII students cannot correctly solve a numerical division problem and more than a quarter of them cannot read a primary level text. The picture is slightly more encouraging at the Class III level, where there has been gradual improvement since 2014. However, even in 2018, less than 30% of students in Class III are actually at their grade level, that is, able to read a Class II text and do double digit subtraction. The ASER survey covered almost 5.5 lakh children between the ages of 3 and 16 in 596 rural districts across the country. In an encouraging trend, it found that enrolment is increasing and the percentage of children under 14 who are out of school is less than 4%. The gender gap is also shrinking, even within the older cohort of 15-and-16-year-olds. Only 13.6% of girls of that age are out of school, the first time that the figure has dropped below the 15% mark. “The list of eligible borrowers has been expanded. All entities eligible to receive foreign direct investment can borrow under the ECB framework,” the central bank said in a statement on Wednesday. The new framework takes immediate effect. The RBI has decided to keep the minimum average maturity period at 3 years for all ECBs, irrespective of the amount of borrowing, except for borrowers specifically permitted to borrow for a shorter period. Earlier, the minimum average maturity period was five years. The ceiling for borrowing remains at $750 million. Any entity who is a resident of a country which is financial action task force compliant, will be treated as a recognised lender. “This change increases lending options and allows various new lenders in ECB space while strengthening the [anti money laundering / combating the financing of terrorism] framework,” it said. RBI had capped funds raised via ECBs at 6.5% of GDP, at current market prices. Based on GDP figures for March 31, 2018, ‘the soft limit works out to $160 billion,’ RBI had said. The processing time for your income tax returns could well take only a day, as compared to 63 days now, if a proposal approved by the Cabinet on Wednesday fructifies. The proposal is for the development of an upgraded e-filing portal that would ease income tax return filing and reduce the processing time for returns, the government announced. The Integrated E-filing & Centralized Processing Center 2.0 is expected to take 18 months to develop and three months to be tested before it is implemented, and an amount of Rs. 4,241.97 crore has been set aside for it. The portal will be operational for eight years, and the project has been awarded to Infosys, which emerged as the lowest bidder. “This approval has significant benefits for the Department and taxpayers through various functionalities such as pre-filling of ITR and acceptance by taxpayer as a means to improve accuracy and to reduce refund/processing turnaround time drastically, and facilitation to taxpayers in resolving outstanding tax demands,” the government said in a release. Mr. Goyal added that in the current version of the automatic processing system, about 23 crore income tax returns have been filed so far. He said that refunds of Rs. 1.83 lakh crore have been issued in the current financial year up to September 30. The British government led by Theresa May survived a vote of no-confidence by a narrow margin of 19 on Wednesday evening. The vote came at the end of a five-hour debate on a motion tabled by Opposition leader Jeremy Corbyn, who accused the government of failing the country and turning a deal that had been touted as “the easiest in history” into a “national embarrassment. The vote followed the huge defeat suffered by the government on Tuesday night, when MPs rejected the government’s Brexit withdrawal deal by a margin of 230. The margin was considerably larger than the 166 votes by which the minority government of Ramsay Macdonald lost a vote in 1924, which Mr. Corbyn said would have led any other leader to do the “right thing” and resign. Ms. May had been hoping that she could go back to Brussels to ask for changes that could then be put to Parliament again in a vote but given the scale of the defeat, EU leaders are likely to see little point in making efforts on this. Many are now pressing for Britain to request a delay to Brexit, which Ms. May has so far been reluctant to do. In addition, with no political consensus in the U.K. in sight, it is unclear whether European leaders would agree to this. Over 650 acres of land off Colombo’s seafront, where a China-backed $1.4 billion port city is currently being built, has been reclaimed, Sri Lankan authorities said on Wednesday. Beijing attaches great importance to the port city, Chinese Ambassador to Sri Lanka Cheng Xueyuan said at a ceremony held to mark what the Sri Lankan government termed “another milestone” in the mega project. The total investment is expected to go up to $15 billion when the project is completed.Executed by CHEC Port City Colombo (Pvt) Ltd, the port city, according to government estimates, is likely to draw about $15 billion in investment, when completed. CHEC is a subsidiary of China Communication Construction Company, in which the Chinese government is a major stakeholder. The plan for mega port city adjoining Colombo’s iconic sea front called the Galle Face envisages plush offices, residential units, education and hospital facilities and a “central park”, to make it a “financial hub”, linking markets and investors across Asia. The Sri Lankan government has pledged its support to China’s ambitious OBOR initiative, with the hope of promoting the island as a trading hub in the Indian Ocean region. Fasting can boost the body’s metabolism and help protect against age-related diseases, a study has found. While food is known to influence clocks in peripheral tissues, it was unclear, until now, how the lack of food influences clock function and ultimately affects the body. While fasting, researchers noted the mice exhibited a reduction in oxygen consumption (VO2), respiratory exchange ratio (RER), and energy expenditure, all of which were completely abolished by refeeding, which parallels results observed in humans. “The reorganisation of gene regulation by fasting could prime the genome to a more permissive state to anticipate upcoming food intake and thereby drive a new rhythmic cycle of gene expression,” a scientist said. The study opens new avenues of investigation that could lead to development of nutritional strategies to improve health in humans. On the auspicious day of Pongal, the 12-year-old defeated Dinesh Sharma in the ninth round of the Delhi International Open GMs chess tournament for his third and final GM norm. The country’s 59th GM is also the youngest after breaking the record of state-mate R. Praggnanandhaa set in June last year.